[REVOLUTIONARY WAR]. Newspaper. Pennsylvania Packet or General Advertiser. John Dunlap, Philadelphia, Pa., July 1, 1779. 4 pp., 10½ x 17, untrimmed. Page 1-2 leads with extracts from the Journals of Congress regarding Indian Affairs and New Hampshire land disputes. Extensive content on the Revolutionary War medical department, including a lengthy, serialized “Doctor Morgan’s Vindication” regarding the Continental Congress’s dismissal of Dr. John Morgan (who had great success managing military hospitals for Washington’s Army) without cause or explanation. Here, he obtains testimony from General Nathanael Greene, and even Washington himself, to defend his reputation. 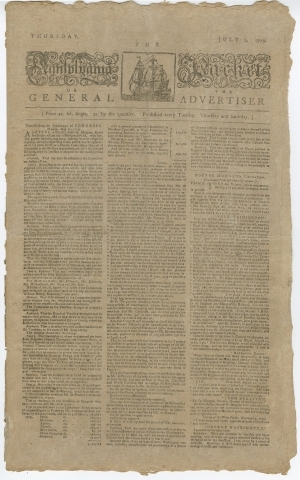 Page 3 reports war news from Pennsylvania, as well as a June 29, 1779 act of the Continental Congress borrowing $20 million to maintain fiscal solvency. Page 4 includes advertisements for runaway slaves, book auctions, and stolen horses. “IN CONGRESS, June 29, 1779. AS Congress are bound by every motive of policy and of public & private justice to maintain the credit of the paper money emitted by their authority on the faith of the United States; so it is their intention not only to avoid further emissions but to diminish the quantity in circulation, provided that the respective States by correspondent and vigorous exertions shall put it in their power to raise the necessary supplies. Resolved therefore, That twenty millions of Dollars, or such a part thereof as shall be brought into the Continental Loan-Offices on or before the first day of October next, be borrowed on the faith of the United States, at an interest of six per cent. per annum. 1. That the Loan-Officers in every state do immediately open subscriptions for the said Loan. 2. That the executive authorities of the several states be requested immediately to appoint persons of character and influence in every county, town or district, to receive subscriptions and transmit the same to the Loan-Officer or Officers in the states respectively. 3. That no subscription be received for less then five hundred dollars. 4. That all subscriptions under ten thousand dollars shall be paid into the Loan-Office where the same shall be subscribed, or into the Hands of the person obtaining the subscription, within fourteen days after the subscription shall be made. 5. That any person subscribing ten thousand dollars or upwards shall be allowed to pay the same at two periods, to wit, one half within fourteen days after the subscription, the residue on or before the first day of October next; the whole to bear interest from the time of the first payment, provided the other payment shall be punctually made. 6. That each lender shall have his election either to receive the principal at the expiration of three years from the date of the Loan, or to continue it in the funds on interest until the whole amount of Continental bills in circulation shall not exceed the sum in circulation at the time of the Loan. 7. That interest on all sums which shall be paid into the Loan-Office before the said first day of October, or which shall be subscribed and paid agreeably to the terms of the 5th resolution aforesaid, shall be payable annually at the Continental Loan-Office of the State in which the money was originally subscribed. 8. That when the interest on Monies which have been, or may be placed in the several Loan-Offices, on, or after the first day of March 1778, shall become due and be paid, the same, until some more accurate standard of value can be devised, shall be increased in proportion to the increase of the sum of Continental paper money which may be in circulation after the date of such Loans respectively.